The Strike King Fishing Log App is a full-featured fishing information log, which allows you to easily collect data on the fly and to store the information for future reference. Strike Kings new web based “Fishing Hole” is a data collection site that helps you catch more fish by remembering your past fishing trips and by helping you choose the best Strike King lure for your next fishing adventure. Just use your mobile smartphone to collect information easily while you’re fishing and through the web you’ll have memories for a life time available on social media sites or saved into your own GPS unit. The following features will help you save and view your information easily. 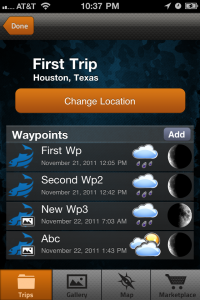 A couple of touches on your smartphone and you’ll have all the information the Pro’s do. View all your old trips. View all your waypoints in Google Maps in its many map viewing screens. Create custom reports to study for your next trip. Back up data on-line so you’ll never loose that adventure. Share trips with friends via Facebook, Twitter, email or MMS. Develop hunting or fishing clubs through shared information. Receive news feeds from Strike King, and its many Pro Guides, (Nobody else gets this secret fishing advantage). Follow the Strike King Pros and learn what they learn about fishing hot spots all around the country. Photo print services of that trophy fish with the touch of button. (Remember to keep that Strike King lure in its mouth, it did the hard work). Taxidermy services with the touch of a few buttons saves that new trophy mount. 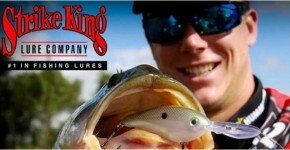 Strike King Discounts and coupons to use at your favorite tackle and sporting goods store. Its not just fishing its safety on the water with features such as “Follow me” which allows for GPS position notification to be sent via email, text or other contact medium of your choice to your “Home” contact person and the ability to set up “Float Plans” on the fly also to your “Home” in case you forgot on your way out the door.